Excellent, this will assist in the planning stages. The Landgraviate of Ober-Schweinsberg is sounding like a 'germanic' place, meaning that this might very well be a 'snowscape' battle? For my part, a snowscape is quite welcome, and it is indeed Germanic. I'm the one who has to keep my game room nice and tidy . . . and I have two cats who feel that they should counter my efforts. I believe that I'll vote for a nice "no snow" look. Of course it doesn't help that I had to shovel snow off of our driveway yesterday either. Are those all supposed to be hills/knolls, etc.? Or are some of them supposed to be depressions? You have the slope lines going in on some and out on others . . . but I'd guess that they're all supposed to be higher than surrounding land . . . is that correct? Yup it did not make sense to build that little home/town in a 'pit'. Normally that 'style' of contour line has the 'slope' part in the little hash marks and the line showing the new 'top' if the lines are on the outside or the old 'level' if the lines are in the inside. You should probably have another Brigadier for the town. Troops not under anyone's command are basically under orders that tell them to just wait . . . and unless they have a Brigadier or General with them, that's about all they can do. So roll up someone to command the townies. One more thing . . . can you please give us a "seniority list" of the Brigadiers on both sides? This is in case their are officer casualties and someone new has to assume command. Murdock, how large a file can your inbox handle? I have uniform and flag graphics done, but I didn't want to flood you. I may stick them up on my website and point you to them so they can be downloaded. Town brigadier: Brigadier Wolfgang Storch - Trained, Cautious. So, just to make life interesting, we have a crowd of aggressive generals coming to the aid of a cautious garrison. That, however, brings up an interesting question. How are Jagers usually placed in your command structure? Further thoughts - objectives. Modify as needed. But I'm thinking for Arnold there's a series of potential objectives. 1) Hold the entry pass. This should be sort of a gimme for them, unless things go badly against them and Asgar's forces are able to push them all the way off the table through the pass. 2) Capture the town. As the only significant outpost except a house or two in a defensible pass, it's an objective in itself. 3) Capture the council. This depends, too, on what you want to do with it and what figures you have available. Could be interesting to have council members scattering with their escorts and allow Arnold's men to attempt to round them up. If you wanted to put this in there, you may want to do some messenger dicing to see at what point someone thinks to tell the council they're in danger. 4) Capture the river crossing(s?). Holding these would be the opposing gimme for Asgar's forces, in theory. On the other hand, it might prompt Asgar to consider leaving a covering force to ensure the crossing stays open. For Asgar, of course, objectives would be protecting the last three, and capturing the first. Another note that occurs to me, for background material, but could if you wish factor into the decision making in the battle. Asgar's Third Brigade and Arnold's Black Brigade were the troops that met at Vergoldeten. The Black Brigade won, so the Third Brigade may have reason to want vengeance. Shannon's Irish Guard (600 men - Elite) - A Guards unit under the former Landgrave. Allocated only the best quality replacements, mostly Irishmen. Performed exceptionally at Vergoldeten, not only holding but advancing in the face of 50% casualties. They simply refused to fail a single morale roll. 7th Line (540 men - Trained) - Sluggish and indecisive at Vergoldeten. Lagged behind enough to leave the 8th hanging. 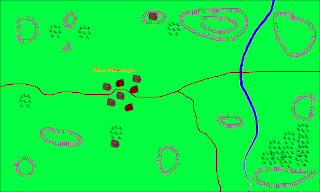 8th Line (540 men - Raw/Poor) - Shattered by a two-one firefight at Vergoldeten, and routed. Not rated Poor do to performance so much as having been brought up to strength hastily with new recruits just before entering winter quarters. Schwarze Eber Fusiliers (510 men - Veteran) - Another Guards regiment of the former Landgrave. Caused heavy casualties to the Irish Guard at Vergoldeten. Emmerich Musketeers (510 men - Veteran) - Basic line regiment, quite satisfactory performance. Potente Musketeers (510 men - Veteran) - Basic line regiment, quite satisfactory performance. Note - a total of 270 Grenadiers, 90 per battalion, are counted in the above 510s. Send off that BIG file. They are commonly 'freely assigned' to either the army command element, or to any of the infantry brigadiers (so far no Russian/Austrian style advance guard mixed Jagers & Cavalry brigades).